The Doktor A 5-Inch Dunny Available Online Now at Kidrobot.com! Finally, someone has understood how boring the living are and invented a way for us to communicate with the dead. 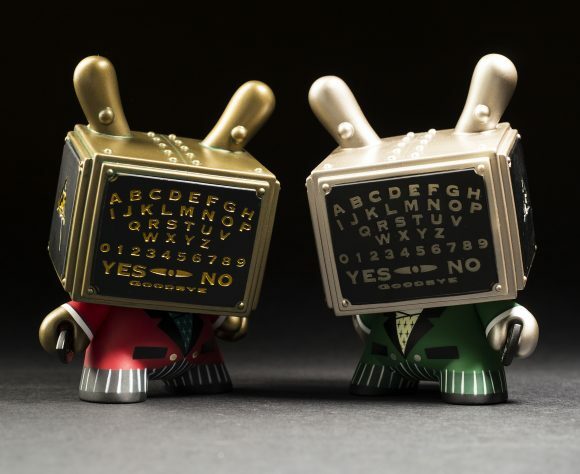 Kidrobot and Doktor A have teamed up to make ghost chit chat a real thing with this Talking Board Dunny. Featuring an unlimited data, talk, and text plan, you can now go from anti-social to an overflowing friends list with just the winding of a key. Hob knob with deceased celebrities, or find out which ancestor is responsible for your webbed toes. The possibilities for good times are as endless as the spirits standing by waiting to speak with you! Don’t ask stupid things though, cause word gets around fast in the after life and upsetting them is a easy way to get yourself on the haunting list. This 5 inch marvel of science is now available from www.kidrobot.com.